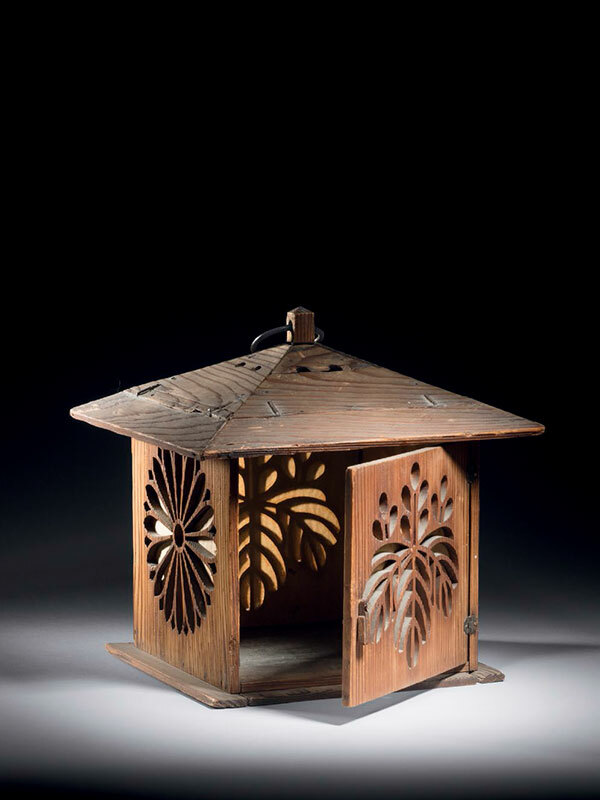 A cedar wood lantern in the form of a small hut with pitched roof, the sides with chrysanthemum and paulownia leaf – shaped openings. One of the sides is hinged, to allow a candle to be inserted. The lamp is suspended from a centrally placed metal ring. This charming cedar wood lantern (the cedar tree (cryptomeria japonica) is Jindai Sugi in Japanese) is reputed to have come from the Imperial Palace (Gosho) in Kyoto. The Kyoto Imperial Palace is the former ruling palace of the Emperor of Japan. The Emperors have resided at the Tokyo Imperial Palace after the Meiji Restoration in 1869, and the preservation of the Kyoto Imperial Palace was ordered in 1877. The Palace lost much of its function at the time of the Meiji Restoration, when the capital functions were moved to Tokyo in 1869. However, the Taisho and Showa Emperors still held their enthronement ceremonies at the palace.